For the 2009 film directed by Bobby Hacker, see Cars 3 (2009 film). For the video game, see Cars 3: Driven to Win. Cars 3 is a 2017 American 3D computer-animated comedy-adventure film produced by Pixar Animation Studios and released by Walt Disney Pictures. Directed by Brian Fee in his directorial debut and written by Kiel Murray, Bob Peterson and Mike Rich, it is the third installment of the Cars film franchise and a stand-alone sequel to Cars 2 (2011). It was executive-produced by then-chief creative officer of Walt Disney Animation Studios and Pixar, John Lasseter, who directed the first two Cars films. The returning voices of Owen Wilson, Bonnie Hunt and Larry the Cable Guy are joined by Cristela Alonzo, Chris Cooper, Armie Hammer, Nathan Fillion, Kerry Washington and Lea DeLaria, in addition to a dozen NASCAR personalities. In the film, Lightning McQueen sets out to prove to a new generation of high tech race cars that he is still the best race car in the world. Released worldwide in movie theaters on June 16, 2017, along with its theatrical animated short film Lou, the film grossed $383 million worldwide and received mainly positive reviews from critics, who praised it as an improvement over its predecessor as well as its emotional story and animation. Lightning McQueen and the other veteran racers of the Piston Cup Racing series suddenly find themselves struggling to win against next-generation rookies like Jackson Storm, who utilize advanced technology and modern training methods. As Storm's breakout success attracts other rookies to the series, most of the veterans either retire or are fired to make way and room for the new generation. In the final race of the season, McQueen desperately attempts to overtake Storm but loses control and suffers a violent and nearly fatal rollover crash, leaving him badly injured. Four months later, McQueen is still recovering in Radiator Springs, isolating himself from his friends and spending his time watching footage of his late mentor, Doc Hudson. After receiving some encouragement from his girlfriend Sally, McQueen decides to return to racing and calls his sponsors from Rust-Eze, Rusty and Dusty, who reveal that they have sold the team to a new owner named Sterling. In a new state-of-the-art training center, Sterling assigns McQueen to train under racing trainer Cruz Ramirez. McQueen becomes impatient over Cruz's methodical approach to training, so he tries to use a high-tech racing simulator - only to end up damaging it. Sterling decides to pull McQueen from racing and use him for merchandise. McQueen rejects this and offers a deal: if he can win the first race of the season, he can continue racing as long as he wants; otherwise, he will retire immediately. Sterling accepts the deal, but assigns Cruz to join him. McQueen tries to train on nearby Fireball Beach but ends up spending most of his time teaching Cruz how to drive on the sandy terrain. McQueen then attempts to join a race incognito at a famous dirt track called Thunder Hollow, but inadvertently enters a figure-8-style demolition derby with Cruz, which she wins, much to McQueen's embarrassment. Distraught at the apparent waste of training time, McQueen rages at Cruz and in the process accidentally breaks her trophy. Upset, Cruz reveals that she had wanted to be a racer just like McQueen all her life, but never started a race due to her feeling intimidated and outclassed by the other racers. She resigns as McQueen's trainer and heads back to the training center. Guilty and with no other options, McQueen calls his friend Mater for advice. He suggests that McQueen tracks down Doc's mentor Smokey, in Doc's hometown of Thomasville, so McQueen catches up to Cruz and convinces her to rejoin him. In Thomasville, McQueen meets up with Smokey, who reveals that despite the fact Doc never raced again - he found a new happiness in training McQueen. After McQueen accepts that he will never be as fast as Storm, Smokey and his friends help McQueen learn new tricks to overcome his speed disadvantage, using Cruz as his sparring partner. However during the final practice race, Cruz suddenly overtakes him and he suffers a flashback to his crash, shaking his confidence. At the race in Florida, McQueen starts last, but with coaching from Smokey in the pits, manages to gradually push up the ranks. Sterling, who still believes McQueen can't win, orders Cruz back to the training center, despite her wanting to stay and watch the race. McQueen overhears the exchange, and remembers how Cruz never fulfilled her dream of racing. He decides that Cruz is the answer to beating Storm, so gets her back and his crew outfits her with racing gear so she can finally race. While shaky at first, Cruz is able to push up the ranks thanks to McQueen coaching her, and eventually ends up right behind Storm. Storm, feeling threatened, tries to intimidate Cruz - even to the point of ramming her against the wall in the final lap. Cruz however uses one of Doc's old tricks to outmaneuver him and wins the race. As Cruz celebrates her victory, Sterling offers her a role on his team, but she instead takes a counteroffer from legendary owner Tex Dinoco. Sterling reminds McQueen about his bet but as McQueen started the race that Cruz finished, he gets a share of the win, thus winning his bet. Sometime later, McQueen and Cruz return to Radiator Springs, where McQueen reveals that Tex, after seeing Sterling's callousness, has bought Rust-eze from him, and McQueen, now decked in Doc's racing colors, decides to continue racing and train Cruz. Owen Wilson as Lightning McQueen, a legendary Piston Cup veteran. Cristela Alonzo as Cruz Ramirez, Lightning McQueen's trainer. Chris Cooper as Smokey, Doc Hudson's former mechanic and crew chief. Nathan Fillion as Sterling, a rich business car and the new Rust-eze team owner. Larry the Cable Guy as Mater, a jolly tow truck and Lightning McQueen's best friend. Armie Hammer as Jackson Storm, McQueen's new racing rival. Tom and Ray Magliozzi as Rusty and Dusty Rust-eze, respectively, the owners of Rust-eze. Following Tom's death in 2014, unused archive recordings from the first film were used for Rusty's lines. Tony Shalhoub as Luigi, a Fiat 500. Guido Quaroni as Guido, a forklift who is Luigi's best friend and assistant. Bonnie Hunt as Sally Carrera, a Porsche 996, and Lightning McQueen's girlfriend. Lea DeLaria as Miss Fritter, an intimidating monster school bus at the Thunder Hollow demolition derby. Kerry Washington as Natalie Certain, a statistical analyst. Additionally, several drivers and other racing-related personalities from NASCAR have cameos, including Chase Elliott, Ryan Blaney, Darrell Wallace Jr., Shannon Spake, Daniel Suárez, Kyle Petty, Mike Joy, Ray Evernham and as well as Darrell Waltrip, Humpy Wheeler, Jeff Gordon, and Richard Petty's return as Darrell Cartrip, Tex Dinoco, Jeff Gorvette, and Strip "The King" Weathers, who now acts as Cal Weathers' (his nephew) crew chief. Doc Hudson appears in flashbacks with unused audio recordings of the late Paul Newman from the first film. Development on Cars 3 began in late 2011 after the release of Cars 2 and by March 2014, pre-production on the film was underway. In October 2014, Pixar's former chief creative officer John Lasseter revealed at the Tokyo International Film Festival that the film would feature a tribute to Hayao Miyazaki's film The Castle of Cagliostro, in a form of an old Citroën 2CV. Prior to the film's release, John Lasseter, director of the previous Cars films, stated that the film had a "very emotional story", similar in tone to the first film. Co-writer Kiel Murray, who also co-wrote the original Cars, said of the return to the series roots, "With these franchises you always want to know who it's about. The first movie was about McQueen, and the second movie was a sort of off-ramp to the Mater story. We wanted to get back to the McQueen story. When we looked at what would be next for him, we wondered what that would be like both as an athlete, and also for what he was dealing with in the rest of his life." According to director Brian Fee, the production team did a lot of research, and, while they "looked at athletes in other sports", the team mainly focused on NASCAR racers. Fee said that they "even talked to a sports psychoanalyst who explained that many of these drivers can't imagine themselves doing anything else", an idea that resonated with the team. Mike Rich said that rookies taking over the sport is a "kind of endless story in sports", and compared McQueen to Wayne Gretzky and Misty May-Treanor as well as many others. Fee said that "being a parent became [his] main resource to ﬁnd and understand the emotion" in the film's storyline. Scott Morse, the film's story supervisor, said that he wanted to highlight the film's emotional core and the character's relationships, wanting the film to feel like a sports film while also focusing on McQueen realizing "what their relationship meant to Doc." On January 5, 2017, it was announced that Armie Hammer and Cristela Alonzo would voice Jackson Storm and Cruz Ramirez, respectively. Two months later, Nathan Fillion, Kerry Washington and Lea DeLaria joined the cast. The production utilized a new rendering system, RIS, which made scenes like the demolition derby race possible. The system was previously used on Pixar's Finding Dory. In previous movies the animators had to first do the animation before the rendering, but RIS allowed animation and rendering to take place simultaneously in a process called "hardware shading", making it much easier for the animators to see what a completed scene would look like when finished. Fee said that the film's animation is "art directed realism" and stated that it causes the film's characters and sets to "feel more real and alive than ever before", while Bill Cone, the film's production designer, said that "The term [they] use is believability, which is the basis for everything [Pixar does]". Global technology supervisor Sudeep Rangaswamy said that his team used an authomatic process for the film's shots, which, in his words "allows a lot of flexibility" and that "It made shots that were previously impossible to render possible". Director of photography-camera Jeremy Lasky and editor Jason Hudak researched NASCAR footage for the film's race scenes. Fee said that both the score and the soundtrack "really help support the story we are telling". Both the soundtrack and the score were released on June 16, 2017. "Ride (featuring Gary Clark Jr.)"
The soundtrack features "Run That Race", an original song written and performed by Dan Auerbach, who stated the song is "about never giving up and always trying your best". Auerbach said that the filmmakers showed him the story and some dialogue, from which he pieced together a story for the song. The soundtrack also features "Ride", an original song performed by ZZ Ward featuring Gary Clark Jr., which was released as a single on April 14, 2017. The film's score was composed by Pixar's frequent collaborator, Randy Newman, who previously composed the first film's score. Tom MacDougall, Disney's executive vice-president of music, said that Newman has "a real connection to the Cars world" and that "His ability to capture the feelings on this film, its characters, locations, and the Americana theme through out is extraordinary-the music is so naturally fluid and inspired. It really feels like Randy is coming home with this score". Newman quoted tracks from the first film in moments where Fee "wanted to evoke an earlier time." 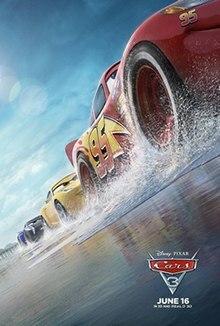 Cars 3 was released in movie theaters on June Friday 16, 2017, in the United States, in 3D, Dolby Cinema and selected IMAX theaters, accompanied by the Pixar short film Lou. The film had a special screening for the NASCAR industry in Kannapolis, North Carolina on May 23, 2017. The world premiere was held in Anaheim, California on June 10, 2017. A tie-in video game has been announced to accompany the film's release. It was developed by Avalanche Software, which was shut down by Disney in 2016, but was acquired and revived by Warner Bros. Interactive Entertainment. It was released on Nintendo Switch, PlayStation 3, PlayStation 4, Wii U, Xbox 360, and Xbox One on June 13, 2017, in North America, in Europe and Australia on July 14, 2017, and in Japan on July 20, 2017. As Disney no longer develops and publishes video games after the release of Disney Infinity 3.0, Warner Bros. Interactive Entertainment published the tie-in game. Cars 3 was released on Digital Movie Copy HD on October 24, 2017 and was released on DVD, Blu-ray, and 4K Ultra HD Blu-ray on November Tuesday 7, 2017, by the Walt Disney Studios Home Entertainment. BBC, Disney and LEGO released a short film via YouTube, on April 13, 2018, that is inspired by both the Cars animated series as well as the popular TV series Top Gear. The film tells the story of Lightning McQueen's trip to the Top Gear track, where he achieves his dream of racing against the Stig. Cars 3 grossed $152.9 million in the United States and Canada and $231 million in other territories for a worldwide total of $383.9 million, against a production budget of $175 million. In North America, Cars 3 was released alongside Rough Night, 47 Meters Down and All Eyez on Me, and was projected to gross $55–60 million from 4,256 theaters in its opening weekend. It made $2.8 million from Thursday night previews and $19.5 million on its first day. It went on to open to $53.7 million, finishing first at the box office and dethroning two-time first-place finisher Wonder Woman. Cars 3 had the lowest opening of the series, but nevertheless was the 16th Pixar film to debut at number one. In its second weekend, the film grossed $24.1 million, dropping to third place, behind Transformers: The Last Knight and Wonder Woman. In its third weekend the film made $9.7 million ($14.1 million over the five-day 4 July holiday weekend), dropping to 5th. Internationally, the film made $21.3 million from its opening in 23 markets, which was 9% more than Cars 2 and 29% more than Cars. The film opened in China on August 25 and grossed $10.8 million over its debut weekend. The biggest markets in terms of total earnings are China ($20.8 million), followed by France ($19.5 million), Japan ($16.1 million), Mexico ($15.6 million), and the UK ($15.2 million). On review aggregator Rotten Tomatoes, the film has an approval rating of 70% based on 217 reviews with an average rating of 6.1/10. The website's critical consensus reads, "Cars 3 has an unexpectedly poignant story to go with its dazzling animation, suggesting Pixar's most middle-of-the-road franchise may have a surprising amount of tread left." On Metacritic, which assigns a normalized rating, the film has a score of 59 out of 100, based on reviews from 41 critics, indicating "mixed or average reviews". Audiences polled by CinemaScore gave the film an average grade of "A" on an A+ to F scale. Owen Gleiberman of Variety wrote, "Cars 3 is a friendly, rollicking movie made with warmth and dash, and to the extent that it taps our primal affection for this series, it more than gets the job done. Yet in many ways it's the tasteful version of a straight-to-DVD (or streaming) sequel." David Fear of Rolling Stone gave the film a positive review, saying: "There's an emotional resonance to this story about growing old, chasing glory days and the joy of passing the baton that leaves the other two films choking on its digitally rendered dust. The end goal this time out isn't just to sell a few more toys and Lightning McQueen lunchboxes. It's actually tapping into something deeper than a corporate bottom line." Mike Ryan of Uproxx called the film 'The Rocky III Of The Cars Franchise,' and wrote "There's a hint of sadness that seems to be present throughout Cars 3 that gives it a little more weight than the previous installments." Alonso Duralde of TheWrap gave the film a mixed review, saying: "As a spawner of merchandise, Cars 3 fires on all pistons but, as a movie, it's a harmless but never stimulating 109 minutes." Vicky Roach gave the film 3 out of 4 stars, saying: "Returning to the iconic, backroads nostalgia of the original film, Cars 3 puts the flashy, unpopular middle film squarely in its rear vision mirror. The route that the filmmakers take might be familiar, but after gunning it, they take the corners like pros." Regarding a possible Cars 4, Cars 3 producers Kevin Reher and Andrea Warren stated speaking to Cinema Blend that "If there's a good story to tell, I mean, our heads kinda break after having gotten this one done, like "oh my God" what could you do the further adventures of? But like any sequel, from Toy Story 4 to Incredibles 2, as long as there's a good story to tell it's worth investing, we do love these characters, we love them as much as the public does." Regarding which character would be the main protagonist in the film, Reher and Warren stated that "if Cruz is a breakout character, kind of like Mater was, she would be involved in a 4". Owen Wilson stated at a Cars 3 press event that possible stories have been discussed for a Cars 4, though he would personally like for a fourth Cars film to delve into aspects of the thriller genre, akin to Cars 2. In an interview with Screen Rant, Lea Delaria expressed interest in reprising her role as Miss Fritter while promoting the release of the short film, Miss Fritter's Racing Skoool with the Cars 3 DVD and Blu-ray release. ^ a b c d e f g h i j k "Cars 3 Production Notes" (PDF). Walt Disney Pictures. Retrieved 10 June 2017. ^ Cross, Dominick (26 February 2016). "Newman on Putin, people, politics, music". The Advertiser. Archived from the original on 2 March 2016. Retrieved 26 November 2016. ^ Mendelson, Scott. "Pixar's 'Cars 3' Review: Lightning (McQueen) Strikes On The Third Lap". Forbes. Retrieved June 17, 2017. ^ a b "Cars 3 (2017)". Box Office Mojo. IMDb. Retrieved May 14, 2018. ^ a b c Libbey, Dirk (24 February 2017). "Cars 3 Has A Dozen NASCAR All Stars, Here's Who They Will Be Playing". CinemaBlend. Retrieved 24 February 2017. ^ "'Cars 3': Here's What Critics Are Saying About Pixar's Latest Film". Entertainment Weekly. Time Inc. June 12, 2017. Retrieved June 25, 2017. ^ a b c Alexander, Bryan (30 May 2016). "Sneak peek: 'Cars 3' zooms ahead with new character Cruz Ramirez". USA Today. Retrieved 23 July 2016. ^ a b c Snetiker, Mark (5 January 2017). "Cars 3 first look: Meet Pixar's new millennials". Entertainment Weekly. Time Inc. Retrieved 5 January 2017. ^ "Meet the NASCAR legends who inspired four new 'Cars 3' characters". ESPN.com. Retrieved 6 June 2017. ^ a b c "Cars 3 Cast: Meet New Characters Voiced by Nathan Fillion, Kerry Washington & Lea DeLaria". /Film. 9 March 2017. Retrieved 6 June 2017. ^ a b c Milligan, Mercedes (9 March 2017). "Disney-Pixar 'Cars 3' Key Cast and Characters Roll Out". Animation Magazine. Retrieved 11 March 2017. ^ a b c McGee, Ryan (29 March 2017). "New 'Cars 3' characters inspired by NASCAR legends". ESPN.com. Retrieved 29 March 2017. ^ Libbey, Dirk (February 24, 2017). "Cars 3 Has A Dozen NASCAR All Stars, Here's Who They Will Be Playing". CinemaBlend. Retrieved February 24, 2017. ^ Desowitz, Bill (April 26, 2017). "'Cars 3': How Pixar Channeled Paul Newman to Get Back on Track — Watch New Trailer". IndieWire. Retrieved April 27, 2017. ^ "Interview: "Cars 3" Producer Kevin Reher". Laughing Place. October 27, 2017. Retrieved October 29, 2017. ^ Graser, Marc (18 March 2014). "Disney Plans Third 'Cars,' 'The Incredibles 2'". Variety. Retrieved 19 November 2016. ^ Frater, Patrick (24 October 2014). "John Lasseter Hails Hayao Miyazaki, Japan and the Joy of Juxtaposition". Variety. Retrieved 19 November 2016. ^ "Cars 3: John Lasseter Talks 'Very Emotional' Story". Screen Rant. Valnet, Inc. 11 June 2016. Retrieved 10 April 2017. ^ "Cars 3: The Third Act". Creative Screenwriting. 16 June 2017. Retrieved 16 June 2017. ^ Failes, Ian (1 April 2017). "CARS 3: Pixar Embraces New Renderer with Stunning Detail". VFX Voice. Retrieved 20 March 2018. ^ "Behind the tech that built Pixar's 'Cars 3'". 26 April 2017. ^ a b c d e f Records, Walt Disney. "Disney•Pixar's "Cars 3" Fuels Two Soundtracks--Cars 3 Original Motion Picture Soundtrack with Original Song by Dan Auerbach, Instrumental Tracks by Brad Paisley and End Credit Track by ZZ Ward; and Cars 3 Original Score Composed and Conducted by Randy Newman". PR Newswire. Retrieved 19 May 2017. ^ "Disney Announces Release Dates for 'Incredibles 2,' 'Cars 3'". Variety. 8 October 2015. Retrieved 20 March 2016. ^ "Cars 3". IMAX. IMAX Corporation. Retrieved May 21, 2017. ^ Truitt, Brian (February 1, 2017). "Sneak peek: Pixar's new 'Lou' short tackles playground bullying". USA Today. Retrieved February 2, 2017. ^ Albert, Zack (June 9, 2017). "Hollywood treatment for NASCAR's young stars in 'Cars 3'". NASCAR. Retrieved June 11, 2017. ^ "Cars 3: Driven to Win Release Date Revealed". IGN. Retrieved 5 April 2017. ^ "Cars 3: Driven To Win On Nintendo Switch Is An Argos Exclusive In The UK". Nintendo Insider. Retrieved 7 April 2017. ^ "カーズ3 勝利への道【公式サイト】". ワーナー ゲーム. Retrieved January 14, 2018. ^ Spangler, Todd (25 January 2017). "'Cars 3' Console Video Game in Works From Warner Bros. Interactive Entertainment". Variety. Retrieved 10 February 2017. ^ "Target : Expect More. Pay Less". www.target.com. Retrieved 2017-09-02. ^ LEGO (13 April 2018). "Mater, Cruz Ramirez, Lightning McQueen and The Stig Race Europe in New LEGO Juniors Top Gear video!" – via YouTube. ^ "Pixar's 'Cars 3' should unseat 'Wonder Woman' at the box office". Los Angeles Times. Tribune Publishing Company, LLC. June 13, 2017. ^ "'Cars 3' To Zoom Past 'Wonder Woman' For Top Box Office Spot – Preview". Deadline Hollywood. Penske Business Media, LLC. July 8, 2017. ^ a b "'Cars 3' $53M+ Is Third Best Debut For Pixar Series; 'Wonder Woman' Still Wows With $40M+; 'All Eyez On Me' Solid". Deadline Hollywood. Penske Business Media, LLC. Retrieved June 18, 2017. ^ "Why 'Transformers' Is Screaming For Reboot After $69M Start; 'Wonder Woman' & 'Cars 3' Fight Over 2nd Place". Deadline Hollywood. Penske Business Media, LLC. June 25, 2017. ^ "'Baby Driver' Speeds to $27M+; Ferrell & Poehler's 'House' Burns Down as 'Despicable Me 3' Dominates". Deadline Hollywood. Penske Business Media, LLC. July 2, 2017. ^ "'Mummy' Leads Overseas; 'Wonder Woman' Cuffs $572M WW; 'Cars', 'Despicable Me' 3s Hit International Box Office". Deadline Hollywood. Penske Business Media, LLC. Retrieved June 18, 2017. ^ "'Dunkirk' Bows To $30M In China; 'Baby Driver' Tops $100M Offshore; 'Despicable 3' At $995M WW – International Box Office". Deadline Hollywood. Penske Business Media, LLC. September 5, 2017. ^ "Cars 3 (2017)". Rotten Tomatoes. Fandango. Retrieved February 22, 2019. ^ "Cars 3 Reviews". Metacritic. CBS Interactive Inc. Retrieved July 30, 2017. ^ Gleiberman, Owen (June 12, 2017). "Film Review: 'Cars 3'". Variety. Retrieved June 25, 2017. ^ Fear, David (June 14, 2017). "'Cars 3' Review: Series Finally Delivers a Movie Deserving of Pixar Name". Rolling Stone. Retrieved June 25, 2017. ^ Ryan, Mike (June 12, 2017). "'Cars 3' Is The 'Rocky III' Of The 'Cars' Franchise". Uproxx. Retrieved July 2, 2017. ^ Duralde, Alonso (June 12, 2017). "'Cars 3' Review: Lightning McQueen Has Mid-Life Crisis as Series Spins Its Wheels". TheWrap. Retrieved July 2, 2017. ^ "Cars 3 does a victory lap". News.com.au. Retrieved June 6, 2017. ^ Knapp, Rebecca Rubin,JD (2017-08-14). "Teen Choice Awards 2017: 'Riverdale,' Fifth Harmony Shut Out Competition". Variety. Retrieved 2017-12-10. ^ "2017 Detroit Film Critics Society Awards Nominations". Detroit Film Critics Society. December 4, 2017. Retrieved December 5, 2017. ^ Amidi, Amid (December 12, 2017). "Annual StLFCA Awards". Sf. Louis Film Association. Retrieved December 12, 2017. ^ "The 2017 Columbus Film Critics Association (CFCA) Nominations". nextbestpicture. January 2, 2018. Retrieved January 2, 2018. ^ Haring, Bruce (2017-11-20). "NAACP Image Awards Nominees: Netflix, OWN Lead In TV; Universal, Annapurna, Open Road Top Film". Deadline Hollywood. Retrieved 2017-12-10. ^ "Art Directors Guild Awards: 'Dunkirk,' 'Shape of Water,' 'Blade Runner 2049' Among Nominees". The Hollywood Reporter. January 9, 2018. Retrieved January 9, 2018. ^ "54th CAS Awards Nominees". Cinema Audio Society. January 18, 2018. Retrieved January 18, 2018. ^ "Will Pixar Ever Do Cars 4?". 27 April 2017. ^ Brayson, Johnny. "Don't Expect 'Cars 3' To End The Franchise". ^ "What Cars 4 Should Be About, According to Owen Wilson". 16 June 2017. ^ "Cars 3 Star Wants Miss Fritters Movie". Screen Rant. November 6, 2017. Wikimedia Commons has media related to Cars 3. This page was last edited on 16 April 2019, at 07:13 (UTC).